Champagne Linguine – aren’t we posh? Not that posh as it happens… we used a sparkling wine from New Zealand (and very nice it was too). Dinner party on Saturday night meant we had some double cream leftover in the fridge. We also had a fizzy wine so this was Sunday night tea. Easy peasy and just a few ingredients. Melt 40g butter in a shallow pan over a low heat. Add a finely chopped onion and 50g finely chopped pancetta and cook for 5 minutes. Pour in 200ml Champagne (or any sparkling wine), turn the heat to medium and cook until the alcohol has boiled off. Stir in 2 tablespoons double cream, season carefully and heat for a few minutes. Cook 350g linguine in lots of salty water until al dente. Divide the linguine between 4 bowls and pour over the sauce. 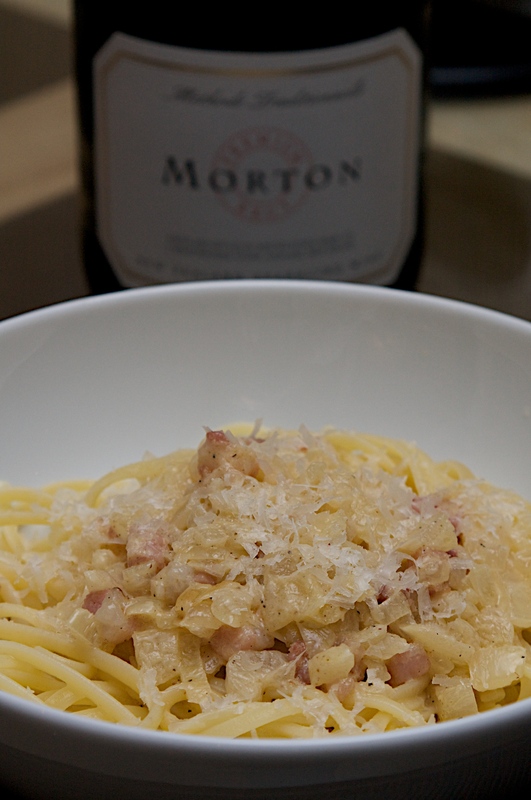 Sprinkle some grated Parmesan over and serve with a glass of Champagne. Thanks again Silver Spoon Pasta.